What are the benefits of Snap-Link Mobile and what features are the most important to highlight for Windows 10 users? The overall benefit of using Snap-Link is the ability to control your home, vacation home and business all from one app with zero fees or contracts. Further, Snap-Link is attached to a professionally installed system that’s been customized for your family and for your home by a specialist in this space. So when it’s set up to your liking, there’s not a lot of work to do. They’ve attached the door locks, window shades, audiovisual components, thermostats, lights, and, of course, standardized products like garage doors and water shutoff valves. Many customers, especially those with large homes or remote homes, love the aspect of opening one app to view the surveillance cameras while being able to unlock the door or arm the alarm. Reliability is key here. Leviton has been providing apps since 2007 for a wide variety of end-user devices, and have focused recently on Android and iOS. 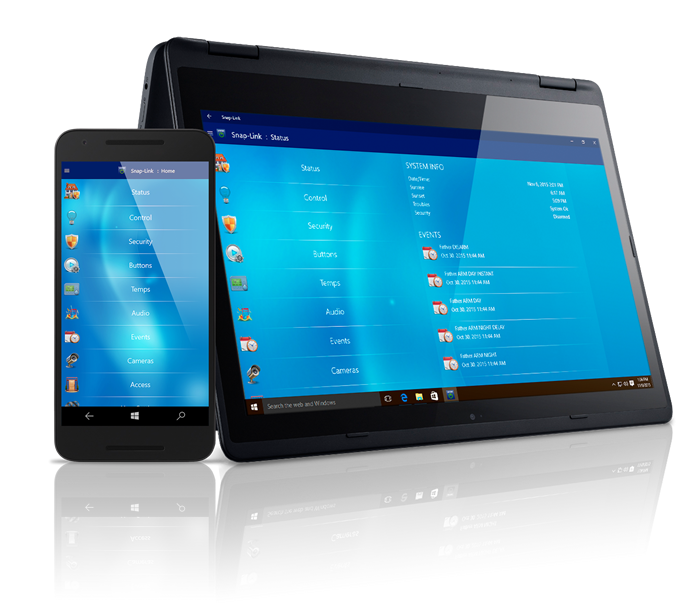 Leviton felt that the partnership with new Windows 10, which provides a clean desktop interface that pipes over to your surface, laptop or Windows 10 smartphone, was a logical next step in our app development process. In fact, many Microsoft employees utilize our automation solutions every day, so they were very receptive to working with Leviton. In addition to controlling many types of devices, Windows 10 live tiles allow end-users to see “Trouble” or “Alarm” before even tapping the app icon to open the control portion. How would you describe a typical Leviton security and automation system in terms of components and functions — and how does Snap-Link Mobile fit into that scenario? There are several strategies in the marketplace right now. For many years, Leviton (and the former HAI) have leveraged the systems integrators as the most knowledgeable individuals, and the industry has relied on them to build this now thriving marketplace. For Leviton, everything from security, energy and entertainment solutions have traditionally tied back to the main brain on-site, our Omni, and have been controlled via Snap-Link Mobile apps. These systems are bulletproof, and that’s because of the valued integrator and their impressive knowledgebase. There’s still plenty of room for these contractors, however, and we love working with them. We spend a lot of resources connecting, educating and assisting them every day. That’s really where Snap-Link Mobile comes into play. The technology puts absolutely everything into a single app that you can easily use, and one that doesn’t cost monthly fees to utilize! It’s the no-nonsense approach. What’s amazing to see is how adept the average homeowner has become when it comes to installing their own basic systems and then sharing those practices and ideas with others to replicate. It turns into a global digital competition that we previously only saw in the front foyer or the backyard. But with each one of these competent early adopters, there are many more individuals who are just dipping their toes into the space and need to be further educated. We get a lot of leads from end-users saying they’ve hit a wall and need to find an integrator in their area to really put all the puzzle pieces together. Leviton is actively supporting both the fully-comprehensive systems integrators that really do incredible things every day with a lot of our devices, while trying to capitalize on the new interest of hungry homeowners that can provide volume sales. As we prepare to roll into 2016, can you share any of Leviton’s significant security & automation product and solution announcements for next year? Leviton just launched the new Omnistat 3 thermostat for hotel rooms that acts as the brain to save energy based on occupancy. It connects ten wireless switches, dimmers, sensors and other load control devices to make an affordable control system that’s perfect for boutiques, B&B’s or chains. The Apple Watch is coming, a free extension for our existing mobile users w/ iOS (Snap-Link Mobile for iOS). Intercom will be our first hardware release in 2016 with a front door station that’s perfect for single-family homes with front doors or gates. The system is able to communicate room-to-room via touchscreen as well, which is also ideal for large residences or commercial properties. We’ll continue to expand our Omni-Bus lighting controls internationally to capitalize on the DIN Rail marketplaces. More wireless devices will hit the market as well with a variety of communication protocols that fit residences and commercial applications alike. For many years, Leviton’s powerful systems have worked well in small commercial properties from restaurants to offices, and we’ll focus more on providing a comprehensive, customized offering for those areas from boardroom audiovisual control to energy management for franchisees going into 2016. Basically, whether it’s simple DIY control with one device or a large airport with thousands of connected controls, our goal is to provide the proper solution that includes not just automation, but the “soup to nuts” experience with a single-source provider. Further, partnerships with third-party DIY hub manufacturers have proven successful for our Z-Wave lighting control devices, and that will continue in 2016. What do you see as some of the most important trends and innovations in home automation and security in 2016? 2015 was the “Year of IoT” (Internet of Things) as many prominent publications proclaimed. For Leviton, IoT was thirty years in the making, as HAI was founded in 1985 with the premise of controlling lights, thermostats and security from a portable cellular telephone that was slung over your shoulder and housed in a shiny black bag. Adoption is so high right now being that customers are coming to us daily with challenges that need affordable and attainable solutions rather than us trying to make things fit. You’ll continue to see smart devices that connect and are controlled in the cloud. You’ll still see comprehensive systems that rope everything together via controller boards, especially for high-end homes that either demand the added security or facilitate many load controls for total management. Partnerships will evolve, competition will increase and end-users will need to remain educated in this rapidly evolving space. Are there any new technology breakthroughs that you can see will change the industry going forward? Obviously the biggest breakthrough for home automation is that smartphone in your pocket. It made the smart home understandable and realistic for the average homeowner or apartment renter, propelling product development forward like we’ve never seen before in the marketplace. As for the future, there are some exciting prototypes that we’re watching, both from a start-up manufacturer perspective and from a technology perspective that will ease installation and adoption. Considering the importance of energy management and cost efficiency in these types of home automation solutions, what is most important for solution manufacturers to consider when designing their solutions for homeowners? The most important aspect when designing solutions is to remember how the end-user will interact and utilize it. In the past, manufacturers have thrown every feature into a product to meet the widest range of needs. Now, things are becoming much more purposefully built. The smart home is cool, we know that. We know what it does and how it benefits us. But when you’re able to tie return on investment to it, showing the end-user they’re saving money either up-front or over the course of a lifetime, that’s when they feel like they’ve bought something valuable and customized. Is the connected health trend something that Leviton is planning to be involved in? While Leviton Energy Management, Controls and Automation may or may not be directly diving into the connected health arena, you’ll see more and more from Leviton that improves the daily lives of our community members. 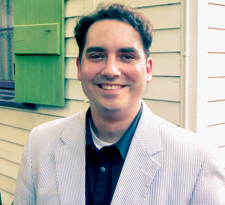 About Greg Rhoades, Director, Marketing, Energy Management, Controls and Automation, Leviton Manufacturing Co., Inc.
Greg Rhoades is a ten-year veteran of HAI/Leviton and the home automation industry, and resides in a fully-automated 200 year old Creole Cottage in New Orleans, LA. Greg’s specific certified expertise is in sustainability and accessibility applications, and he has spoken at FCC summits, worked on CEA/CEDIA applications and is active with global alliances to continue the growth of the smart device marketplace.